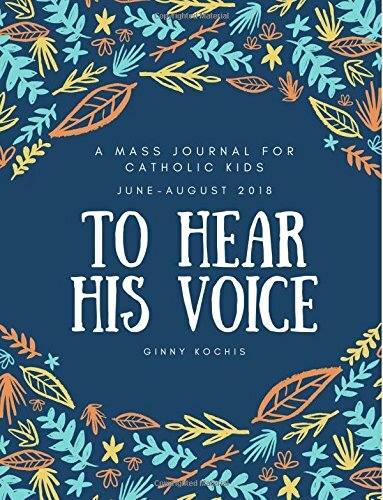 To Hear His Voice is a new Mass journal for children ages 7 – 12 written by homeschooling mom and blogger, Ginny Kochis. It is designed to help children focus more on the Word of God and to reflect upon the Scripture messages. This first issue is designed for June – August 2018 with more issues scheduled to follow. Each week features a list of feast days for that week. All four Scripture readings for Sunday are included: the First Reading, the Responsorial Psalm, the Second Reading, and the Gospel. There is space to take notes as well as a brief meditation on each Scripture passage. This is followed by discussion questions, writing prompts, and ideas to help you share and live God’s Word. To Hear His Voice is colorful and well-designed. Children can write, draw, or simply discuss their answers to the questions. This is great for at-home use as well as for a group religious education class. Ginny Kochis is an author, blogger, and advocate for Gifted and Twice Exceptional children who is passionate about her faith and her children, and enjoys sharing what’s she’s learned with others. She writes about Catholic motherhood, homeschooling, and Gifted/2E parenting on her blog, Not So Formulaic.